MESA: an Alliance or a Gold Mine for America to Dig? It is not just a coincidence that a Middle East Strategic Alliance (MESA) is being rolled out as an ‘Arab NATO’ at a time when the US is also deliberately picking up a fight with Iran. Of course, alliances like MESA would not be required unless there is an enemy to be countered through a supposed combined strength. This is the very logic of practice behind the creation of alliances. Starting from NATO when Soviet Union was cast as an ‘enemy of the free world’ to the creation of MESA, such military alliances have only thrived not just because these alliances provide a pseudo sense of security, but also because these alliances happen to be lucrative business activity for the military industrial complexes. The US president Donald Trump made this point sufficiently clear during the latest NATO summit held last month when he said that the US was willing to help NATO countries buy US-made weapons if they were going to spend the required 4 per cent of their GDP on the alliance. A military alliance is not therefore simply a strategy; it is business as well, one that strongly corroborates with the political economy of defence. The creation of MESA, too, confirms this pattern. First, the US withdraws from the hard-bargained and well-negotiated Iran nuclear deal and thus re-casts Iran as an enemy that can’t be “trusted” and is, in fact, out-there to destroy its rivals. The US then rolls out the idea of an alliance, comprising of countries that are Iran’s rivals, to counter the increasing security threats that Iran is posing. Period. The key question is: how will this alliance, comprising of countries (Saudi Arabia, United Arab Emirates, Oman, Bahrain, Kuwait, Qatar, Egypt and Jordan) that have no indigenous defence industry and some even lack a proper standing army, defend themselves against Iran? Most certainly, they will do so by buying made-in-USA weapons. MESA is, therefore, going to be a gold-mine for the US military industry complex and a real boost for the US president Trump’s “Buy American” plan. While there is hardly any doubt that the creation of MESA would send a new wave of militarization in the Middle East and set off a fresh arms race, the US stands to benefit from it even then. For instance, after Syria, a still largely un-resolved conflict in the region is Yemen, where the Saudis think Iran is supporting the Houthis. While a Saudia led Arab attack on Yemen has already created a worst humanitarian crisis, MESA’s immediate attention would still be Yemen and the imperative of defeating an “Iranian conspiracy”; hence, the immediate need of weapons. Already, the White House has confirmed that the US has been tasked with ‘modernizing’ the Saudi army. The modernizing aspect has its own politics. For example, while the US has already squeezed hundreds of billions of dollars out of Saudia for weapons they don’t need, the Saudis don’t have the required expertise to use these weapons either, which then requires training; hence, the modernizing programs. 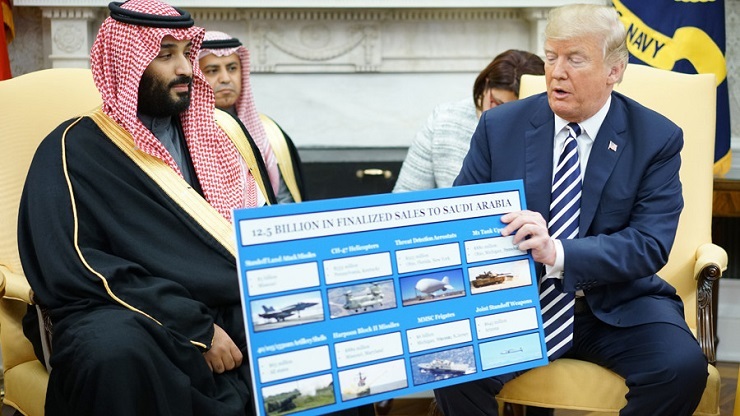 By inking an arms deal worth over 110 billion dollars, Trump president has invariably expanded the potential of Saudia as a weapons market for US military industrial complex. Even if that is not enough, the real prize is in the biggest weapon sale in history, which has the potential to bring in 380 billion dollars for the US over the course of a decade. Weapons deals notwithstanding, this isn’t the only area where the US will be massively benefiting from the Saudi and Gulf money. Gulf countries, particularly Saudi Arabia, are also to make investment, worth billions of dollars in the USA. According to reports, the House of Saud will make a 250 billion dollars of commercial investments in the US, providing the Trump administration with thousands of badly needed new jobs, buying passenger aircraft and investing in US infrastructure projects. Similar is the case with other would-be members of MESA. Among other recent deals made with the Gulf countries include a 2 billion dollars sale of Patriot missile defense systems to the United Arab Emirates, and a proposed 15 billion dollars sale of terminal high-altitude area defense systems and supporting equipment to Saudi Arabia. In March, the US Defense Department announced that Boeing had been awarded a 1.2 billion dollars contract for 28 F/A-18 Super Hornets for the government of Kuwait. Last fall, Bahrain signed on to buy 16 upgraded F-16 Fighting Falcons from Lockheed Martin at an estimated cost of 2.3 billion dollars. Again, when it comes to purely commercial activity, UAE happens to be one of the biggest destinations for US products and investment. In 2016, the US had a 19 billion dollars trade surplus with the UAE, the US’ third largest trade surplus globally. And UAE is undoubtedly the biggest buyer of Boeing air-planes worldwide as well. This is apart from the billions of dollars the tiny Arab state has invested itself in the US. To take just one example, GlobalFoundries, a joint venture between AMD and Advanced Technology Investment Company (ATIC) of Abu Dhabi, has invested about US 17 billion dollars in the US and operates on almost 7000 jobs. Considering the depth of engagement, the US president’s election-campaign rhetoric of extricating the US from the Middle East seems to have been converted into an even more deepening of ties through military cooperation and creation of military alliances such as MESA, which confirms that the US isn’t following a strategy of exit, but a strategy of entrenchment. MESA, in this context, would only further that purpose and hardly counter Iran, although it would continue to project and even provoke Iran into a hostile relationship to justify the sale of weapons and thus keep the economy of military industrial complex well afloat.